Rose hips form on the rose bush after the rose flower has faded and the petals have dropped off. The rose hips are the seed pods and they are known to have many benefits. They are used in cosmetics and food products, as they are great sources of vitamin C and vitamin A. If you find that you have numerous rose hips on your rose bush, and know you won't be able to use them right away, preserve them for later use. Harvest your rose hips after the first frost of the season. At this point the rose hips will be bright red and slightly soft. Snip them from the bush, just below the hip, with a pair of garden shears and place them in a basket. Lay the rose hips out on a window screen that is laying flat on the counter. Allow them to dry for a few days before proceeding. When the skin begins to wrinkle, move on to Step 3. Cut the rose hips in half from top to bottom. Inside the hip you will see seeds and tiny, hairlike fibers. Use a small tool such as a wooden orange stick or skewer to remove the fibers and seeds. Place the rose hips in a colander and rinse them well, making sure all seed and fibrous debris have been removed. Turn your oven to its lowest setting and allow it to warm up. Place the rose hips, in a single layer, on a sheet of parchment paper that is on a cookie sheet. Insert the tray into the oven and leave it in there for four hours. When removing the tray, allow the hips to cool on a countertop for two hours. Store dried rose hips in a sealed plastic bag or glass container in a dark, cool area. Rose hips can be stored indefinitely in the freezer. If stored in the refrigerator or in a cupboard, they will keep for up to three months. Never use metal containers to store rose hips, because the metal will react with the hips and alter the taste. 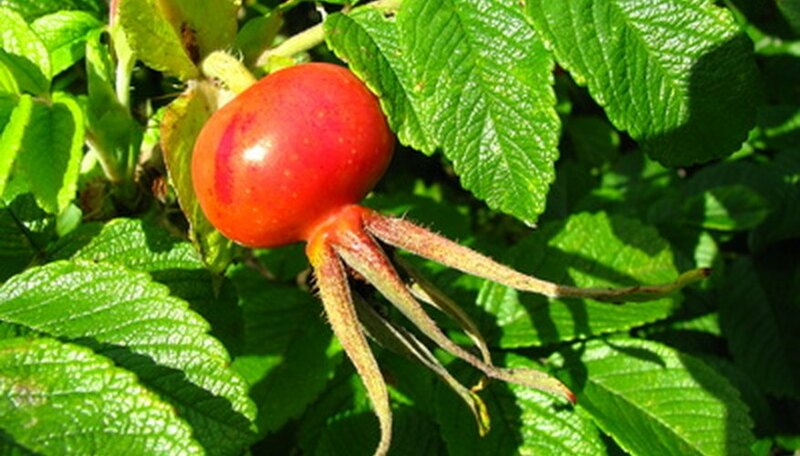 Never use rose hips for food products if you are not 100 percent sure that they have not been treated with pesticides.